Slowly coming back into the blogging world, there are so many topics to tread upon. Yet there is one specific topic that tingles my heart every year at this time. Tis the time of the year for gamers all over the world to get excited about. E3 is just around the corner(June 16th to 18th, although the company hosted conferences happen from June 14th to 16th). I can hear the adrenaline pumping from us gamers who eagerly await these new events and products announced from the world's video game development companies. For the readers who are not familiar with E3, I will give a quick insight into this awesome event. E3 takes place once every year, it is one of the biggest(if not the biggest) video gaming convention on the planet. It has attracted over 45,000 attendees from countries all over the world during the past years. Major video game related announcements are made by companies, big or small, to give the general public a sense of what is to come and a great time to positively hype games and platforms to its utmost height. This was especially used for the new current generation of consoles when they were used to market the systems capabilities to attendees and viewers from the conference live streams. This is just the surface of what E3 is. It is part of a list of annual video gaming events that celebrate the culmination of works that is done by the industry. It celebrates the technological and social breakthroughs of today's world. I, for one, am eagerly awaiting the awesomeness that has been forecasted upon this year's E3. Bethesda is hosting an E3 conference for the first time. They have already teased us with Fallout 4 which looks like an awesome game though the in-game engine does seem a tad less advanced than its competitors. But it is not just about the graphics fidelity, the gameplay must be of equal or better experience. That is where I believe Bethesda has its sweet spot at, if anyone can make a game incredibly fun to spend tons of time in it is Bethesda. Though I must say, the one that I look forward to most is Square Enix's conference. I know they have not had the biggest support from their fanbase in recent years but I believe they are still one of the best companies out there to make games from other IPs other than the ones they have used for decades. I am talking about Tomb Raider! Yes, it is that game again. Tomb Raider's reboot was and still is one of my favourite games from recent memory. It was just so incredibly fun to play as Lara Croft as a whole new character that has a much deeper history and analysis than before. Thus, Rise of the Tomb Raider is definitely on my list of must play games(multiple times). I am hoping that Deus Ex will also get shown but I will not put too much hope into that. Although they have said, Final Fantasy XV will not be shown during the conference at all. What other games might they announce? Nearing the end of my article, I want to mention another is that there is the PC Gaming Show that will be held at 5pm Pacific on June 16th. This is something that I have lots of faith in. PC gaming has been growing at an incredible pace in recent years. While there are exclusives on PC and gaming consoles, it is fitting to have both host conferences within E3 where it might get the most viewers about both mediums. Having E3 as the platform to present to the world what the future holds, it is intensely exciting. Some of the biggest names in PC gaming are showing up and with AMD and PC Gamer presenting, it is bound for an adventure. I also want to stress that I do not believe in that gibber of whether PC or Console is better as both have its own merits and faults. I would love to hear what you are looking forward to and whether or not E3 pumps your blood with excitement. I will also be having streams and videos up on my youtube channel when it gets closer to the 14th. My buddies and I have been setting things up for some fun activities in the coming future! Stay tuned! Busy, Busy, Busy...Ain't it so? Not enough time for games?! Fun times at Blizzcon 2014! It has been ages since I touched this blog. I was going about and then I felt the urge to go down memory lane with my blog. Provided, I did not write many articles on my blog (some of which are not published) I still felt a heavy attachment to it. For my line of work, I work in an industry that has lots of overtime that is spread at a consistent pace. Therefore, I fell on my blogging efforts and then it just snowballed into a big chunk of unfinished pieces and unpublished articles. This year, I felt the need to re-establish my goals and set my mind to keep at a few things that I want to dedicate my time to. I know this is basically a refresh and a whole new beginning for my blog but this is something that was started with excitement and energy only to somewhat falter half-way through. I really want to connect with the online community and see how everything is going. There are so many great and exciting games coming out this year, I cannot even wait to get my hands on these games!! I want to get people's opinions, hear out my own opinion and enjoy this incredible online roller coaster ride! I hope you will share with me in my journey towards a new relationship with my blog. And then came WoD 2014 Woot! Please let me know if there are any games that is especially on people's minds. I will go and grab those first! Warcraft Dinner- Price increase for World of Warcraft - Warlords of Draenor expansion: Justified or not? I have a new segment called the Warcraft Dinner that I am starting now and will be a weekly post on top of other posts. Tune in and please give me feedback on what is not fun to read or is fun to read! So, this article may be a bit late coming into the battle of price increase for the new Warcraft expansion set. Regardless, I felt the need to bring my perspective to the table so that readers and players of World of Warcraft can have another person’s opinion to take in to either alleviate or support whatever they felt before reading this article. -Note: I will only be talking about the price increase for the basic WoW expansion but the collector’s edition is also likely to be increased by $10.00. Before this price increase for the Warlords of Draenor expansion set, all the expansions for World of Warcraft have been at the $39.99 range(excluding collector’s edition, which I will definitely want to get). It has been at this price for quite a long time and I feel like it is long overdue for a price increase. Without paying too much attention to that Activision Blizzard is a company which focuses on getting the most revenue out of the products they produce. The past expansions of Warcraft has given us a lot of content for the price of $39.99. Many people would counter my statement by saying they have us pay an additional monthly fee on top of the purchase for the expansion. But I believe that is necessary for the game to run smoothly and have content keep on piling up after the expansion’s original content has run dry. I have supported my own belief regarding this matter just this week. As I am a very big Blizzard games fan and supporter*, I have played all of their current games and many past ones. Last week was the release of Diablo 3’s new expansion set - Reaper of Souls which is a spectacular game* but it also has a cost of $39.99. I have finished playing through the story content and have tried out the many other features introduced. Through that, I feel a very satisfied gamer. The price of Diablo’s expansion seemed very fitting to me. Yet when I compare the Diablo 3 expansion set to World of Warcraft’s expansion set, I cannot fathom that they are same in price yet differ so much in the content that is offered. Many players do play Diablo 3 over and over through multiple levels and challenges but they are still the same content that would go on for months, if not a full year before another new expansion is introduced. In contrast, World of Warcraft costed just the same price but it offered more content that kept many of its player-base happy until a new patch drops with even newer content. Diablo 3 does not offer that flow of content, neither in gameplay nor story. This can also apply to many other video games that are released or will be released. Those games do not offer hundreds upon hundreds of hours of playability nor the support of the massive content after the game is released. For Warlords of Draenor, we expect to have the normal amount of content as expansions before it and even more with the housing and inclusive level 90 boost. So now that World of Warcraft’s expansion price has gone up, I think it is very much justifiable for Blizzard. But that also means they have to manage and increase the time of which new patches are released instead of having a constant flow of content until the last patch hits and it is a full year of the same raid until the new expansion hits. So if you still think about Blizzard’s increase of the new World of Warcraft expansion is not justified. Go to your local video game shop and look at all the games they offer and think whether or not you would spend your money on the expansion set or the game that costs an average of $59.99 which has not as much gameplay time or all the other perks that come with Warcraft. For me, I am and always will be a gamer at heart so I would always look for new and fun games to play (all within reason and my budget of course) all the while concurrently playing World of Warcraft. Game safe and sound all! * Full Disclosure: I am a very big Blizzard game fan(but also a very big gamer in all aspects). I have not been payed to say anything I post. All games I have reviewed or talked about are bought by me unless otherwise written or stated. * Diablo 3: Reaper of Souls - I will have a review of that game out, hopefully, later this week. Please look forward to that. Spoiler: Very fun game! * If any gaming company is looking or want to have reviews of their games done by me. I am a gamer regardless of the system, as long as games are released I would love to review it. Gah! Finally updated blog! I am back! So it seems I have been on quite a long time of a hiatus. Deep apologies from me. I will not want to bore you with the details on regarding why. Instead I will try to renew the writings of which you, readers, are most familiar with and hopefully enjoy. With me coming back is also the many rants and reviews I have about games and gaming in general. So definitely tune in to my blog frequently! Hope you will like the things I post again and share your own opinion along with mine! LFF - Looking for World of Warcraft Friends! So today I was helping fundraise for the Extra Life 2013 marathon and then I realized that many of my friends who used to play WoW have gone on to do other things and have since left the Warcraft gaming scene. So there I was looking at my friends list and many of them have not logged on for many months. 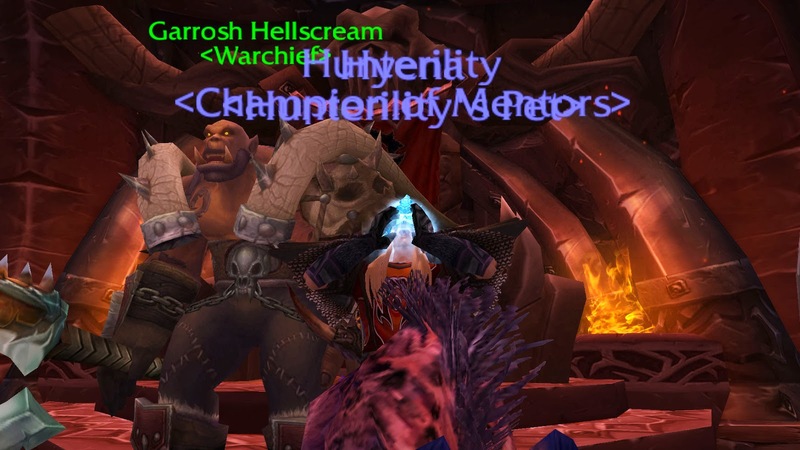 So now I am presented with a dilemma of trying to meet new people in WoW but at the same time, it is incredibly hard to meet people while trying to level up with a level 73. Now I am trying a type of friend finding on my blog. I hope I can definitely meet many people after posting this on here. I want to find someone/people to hang out and share our fun playing the game. It would be great if we were on the same server! 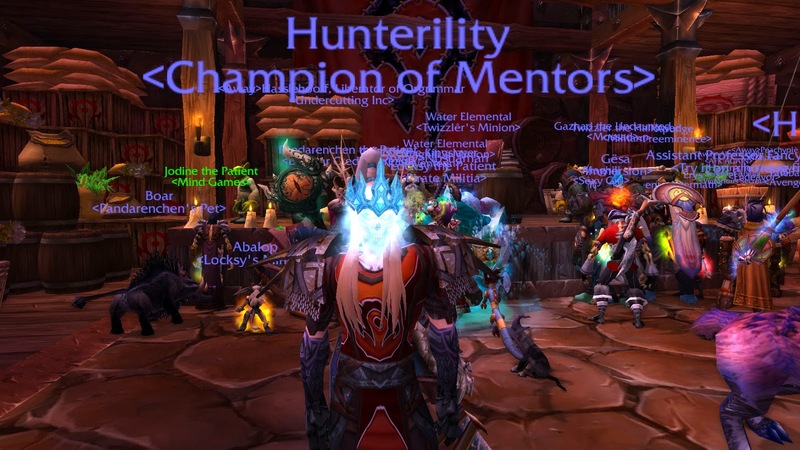 I am on Mal'Ganis US Horde side and my character's name is Hunterility. I hope to get to know lots of new people throughout the game. I welcome new players or veterans into my newly made guild too. 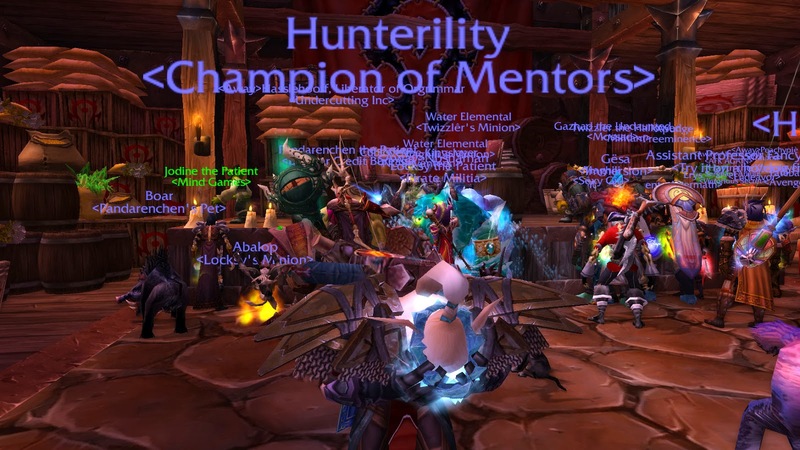 (Mentors) So I hope you will all definitely send my a message or mail and we can all enjoy the fun and frustration of hunting down more WoW expansions in the future! So I was going through my list of games and my gaming news and I noticed something very hard for me to decide had surfaced. I have played a bunch of MMOs: World of Warcraft, Final Fantasy XIV: ARR, Rift, DC Universe Online, Aion, Guild Wars 2, SWTOR, Tera. As you can see, I have dipped my toes in many mmorpg games. The dilemma now is when I went onto my computer and tried to see what games I can play, to my surprise, I have quite a bit of selection. But MMORPGs are not like your normal games, the world evolves and changes when you are not logged into the game. Lots of things change when you are not online and especially when you have not logged on for a long period of time, big evolutions to the world had happened. To me, I feel this is the sad part about playing MMOs where if I do not log in during this patch cycle, for the next patch cycle it will have new contents and it will be much harder for me to catch up with everyone else I know. As an avid World of Warcraft player, when I went to play Final Fantasy XIV when it was re-released for a month or two then come back to WoW I felt that I had fell behind all the people I know since I was not there to play constantly. This stays very true to other MMOs that I have played. I always feel like even if I have not logged on for a few days, I will be more behind than other players. So how do you keep playing an MMO without having the fear of getting behind on content and fun? Do you stick with your choice for a long time after you start investing time into that MMO? Been a long week... Must...Get...Back...To...Gaming...Now! It has been almost a week since I have posted here. Been a pretty busy week for me so I will the pleasantries and get right to the Video Game related rantS! I will be posting back to back these few days for some insanely good opinions coming out of me! But in all seriousness, I really need to finish levelling my character but tis still a long ways off. It definitely gets tedious the more you level. I have levelled so many that I feel not interested in the quests anymore. (Sorry if that sounds a bit like bashing but I really love WoW therefore I want to point out the repetition of levelling to 90 gets slower each time) I have quested all over Azeroth and read each line and followed many different story paths but it would be great if there was a level squeeze in addition to many other things they can change and help progress the game. A big shoutout to Trion Worlds for helping out us gamers for the Extra-Life Marathon! A very big Thank You from us in Vancouver! The marathon is not far away so everyone that has a chance, please help us by donating or participating in the 25 hour gaming marathon!